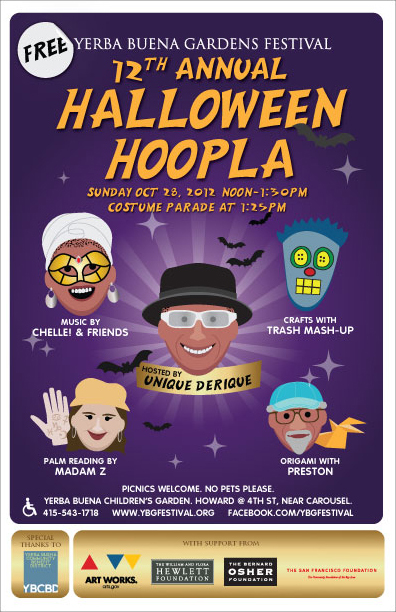 Trash Mash-Up is thrilled to be apart of the Yerba Buena Gardens Festival 12th annual Halloween Hoopla which features interactive performances and games for kids under 10 and their adults. Led by The Unique Derique, the program features dancing to music with Chelle! & Friends, eco-friendly crafts by Trash Mash-Up, origami folding by Preston, and palm reading from the mysterious Madam Z. The program culminates in the eagerly awaited Halloween Costume Parade, where everyone shows off their Halloween finery. Come out to the Yerba Buena Children’s Garden at 4th and Howard in San Francisco, California on Sunday, October 28 from 12noon–1:30pm.